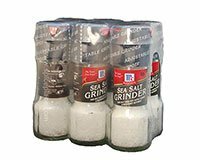 Use McCormick's Sea Salt Grinders to bring Distinction to the Table. Naturally harvested Mediterranean sea salt brings out the best flavors of food. Grinding spices at the moment of use releases essential oils, and brings out the full flavor and aroma. This stylish grinder adds unique appeal-and allows customers to freshly grind their own sea salt controlling the amount of seasoning on every dish. The attractive disposable bottle lends to higher perceived value to your operations and is designed to eliminate refilling, which saves on labor. Disposable - Do not refill.